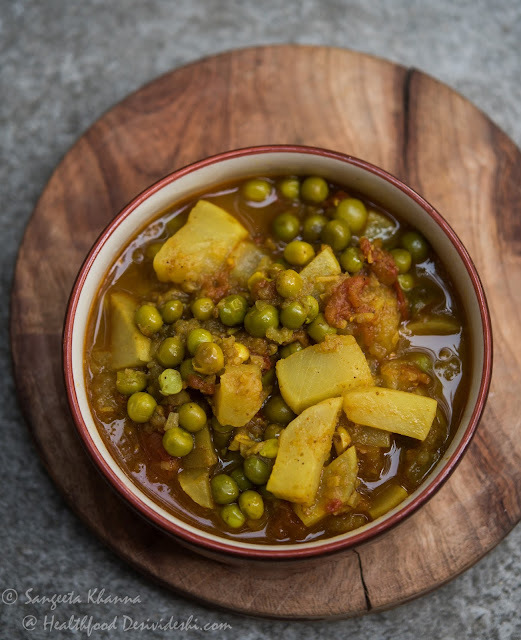 banaras ka khana: shalgam aloo matar ki subzi ... turnips and peas curry with potatoes..
shalgam aloo matar ki subzi ... turnips and peas curry with potatoes..
Shalgam alu matar is one of the simplest curries I make whenever I am pressed for time. It doesn't need much peeling and fine chopping and if there are shelled peas in the fridge this curry can be cooked in a jiffy. I don't add potatoes to this curry always but new poatoes of the season give this curry a nice thickness if you add a few. This style of curry is inspired by the subzi sold by the kachori walas of Banaras which is a perfect accompaniment to pooris. The subzi of every kachori wala is different and yet all of them are equally delicious. There is one more similarity when it comes to the subzi of the kachori walas, all those subzis are made super fast with minimal spicing. Roughly chopped vegetables dunked in a smoky tempering of some hot and aromatic spices and cooked with water till they turn mushy. I have actually watched them cooking. What to do I can't stop myself watching all of this stuff whenever I get a chance. This version of the curry is adapted for home cooking and hence the pressure cooker is put to use saving time for convenience..
Add the dry or fresh ginger as per your choice. I grate a chunk of dry ginger over the pan and it's super quick, no running to fridge, peeling and grating the ginger and the flavors are better than the store bought dry ginger powder. Put the pan back to heat. Add all the chopped vegetables and peas, toss them to coat well, add salt and enough water to make a mushy curry. Cover the pressure cooker and cook till the first whistle blows up. Let the pressure escape on it's own, open the lid and stir the curry lightly with a ladle so that cooked turnips and tomatoes get mushed up. You may like a dash of amchoor powder added at this stage, check seasonings and add amchoor if you feel like. Serve hot with chapatis, crisp parathas or hot pooris for a Sunday breakfast. The only masala used in the curry is my ever so useful everyday curry powder. This curry powder has been named as a magic curry powder by a friend and has been adopted by many of my real life friends . The spice mix has a nice earthy and citrus y blend of flavors and the bay leaves added to it add an extra touch . Very versatile especially for the north Indian stir fries and curries . The thought of summer makes me uncomfortable as the winters days are dwindling fast. Posting a series of turnip curries is my achievements in the season as I have been so occupied to come to my blogs. I think I should start eating salgam. These days I am busy eating Kadam or Ganth Gobi. Very nice recipe, as usual from you. so many dishes out of turnip and lotus stem. 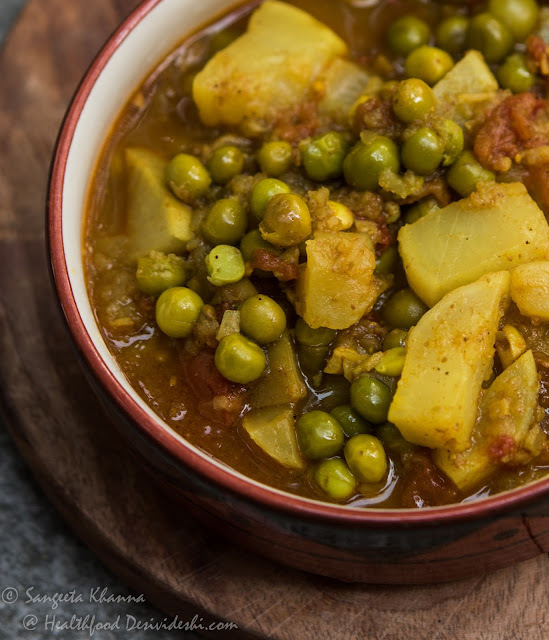 i like turnip and peas curry with potatoes. I have never tasted lotus stem. This has been the most repeated curry at my place as the husband doesn't like shalgam much and in this curry the shalgam vanishes in to the background ....the curry looks and tastes almost like aloo matar .... many people who had this curry could not tell there is shalgam in it ... isn't it the best part when someone is picky ??? Thankyou Sangeeta! I was searching for the Olan recipe you made. It woould be wonderful if you had a recipe list/ tab in your blog too. Came across so many wonderful recipes I want to try! I am intending to make a proper list so that you all can find the recipes easily ... many of the friends have pointed out that and even threatened me too :) Hope i do that fast. Yummy and wish to have the whole bowl. Hi Sangeeta, What a coincidence!! Yesterday I was eyeing the shalgams with the sabjiwala and wondering whether to buy or not, actually I have never bought it, cooked it and dont remember tasting it also, but somehow I wanted to try it out, but had no idea how to cook.. and as if you knew about this here is the recipe.. now thanks a ton for this...will try soon and let you know. Do make these versions of shalgam Rekha !! Sometimes the butter taste may be due to over browning of garam masala , do take care of that . Garam masala is not suitable for shalgam as i remember ,I had added shalgam once to a spicy mutton curry as suggested by a muslim friend n it turned out a bit weird ... this everyday spice powder is milder and complements shalgam well. love all these lovely winter dishes youve been blogging abt, aah no winter without shalgam. Fantastico! love how the curry looks light. I think this is what my hubby asks of me everything I make much alu mattar in the thick onion -tomato pasty-gravy. It is so simple, wish I had know this earlier.